Anyone who is as mad about baking as I am would have heard of Dorie Greenspan. I suppose Dorie Greenspan is to us bakers the equivalent of Julia Child is to chefs. 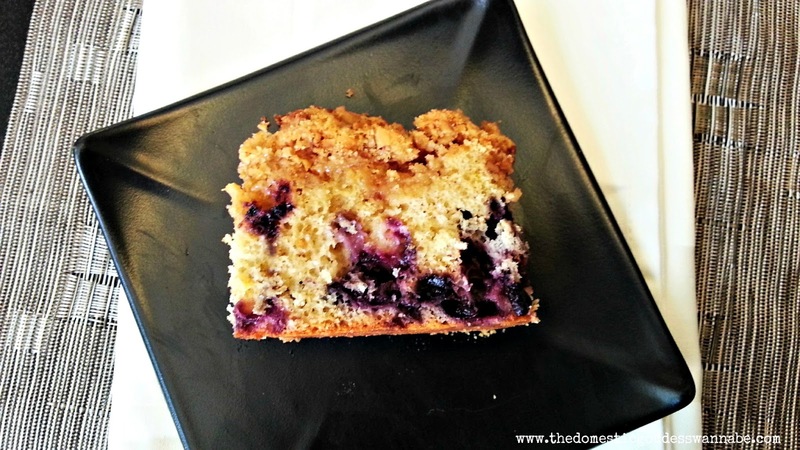 This week I decided to make Dorie’s Blueberry Crumb Cake. As with all of her recipes, there are quite a few steps to follow. The method is not difficult by any means. It is simply that Dorie is just very specific and it is almost like she is there in the kitchen telling you what to do when you bake. Crumb cakes, to me, are so American. 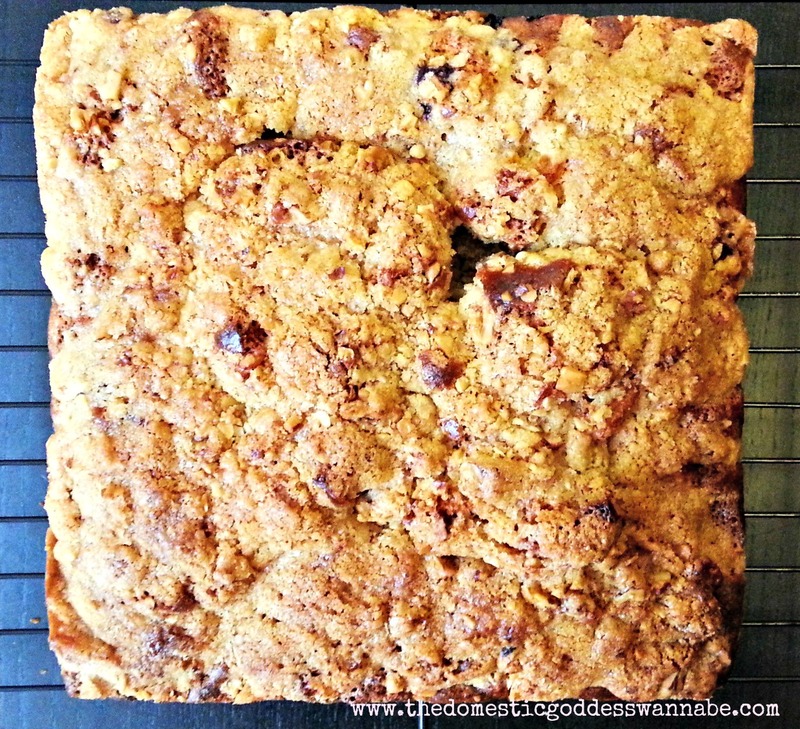 I suppose it is the difference in the textures found in one cake that makes it so appealing – you have the tender bite of the cake at the bottom, and the crunchy texture of the crumbs at the top. I started by making the crumbs. I suppose one can always do everything by hand, but I prefer to handle the butter as little as possible because I do bake in quite a warm kitchen and I do not want to risk the butter melting even more from the heat from my hands. I chopped the walnuts with a knife. 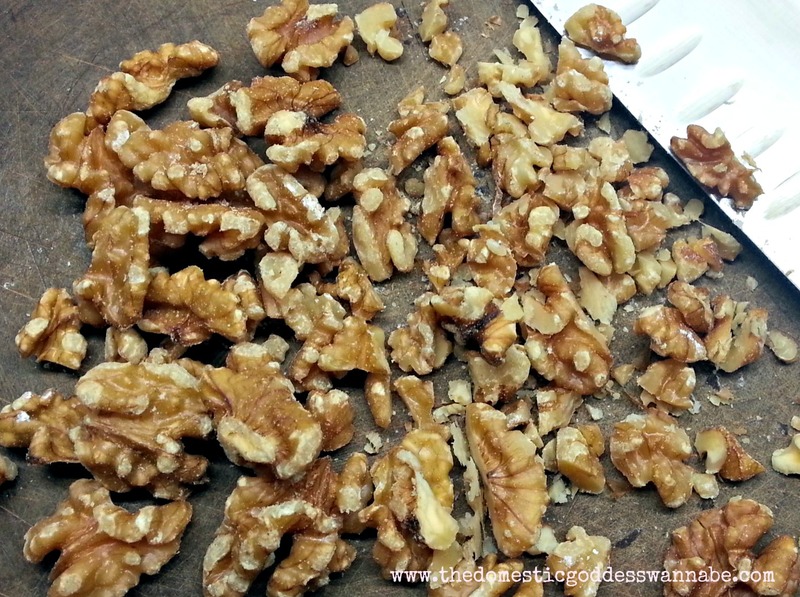 I could have blitzed them in the food processor but there is something about chopping walnuts that I really like. 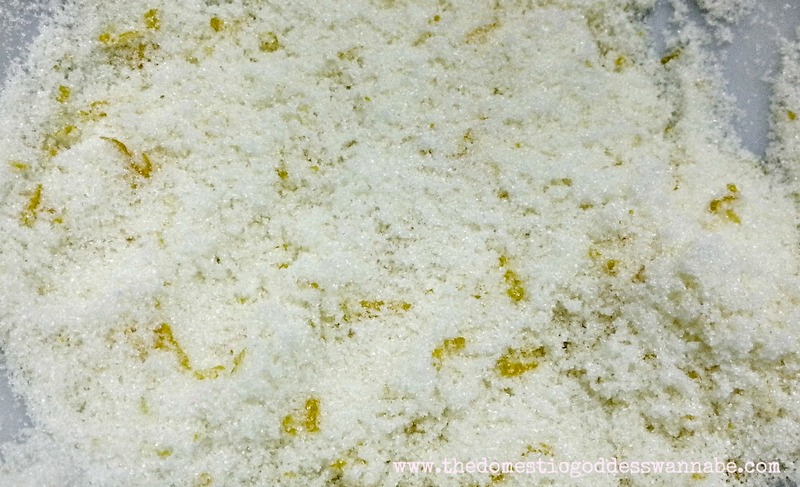 All the ingredients for the crumbs – the sugars, the flour, the salt and the butter were placed in a food processor and pulsed, just until the mixture started to hold together. 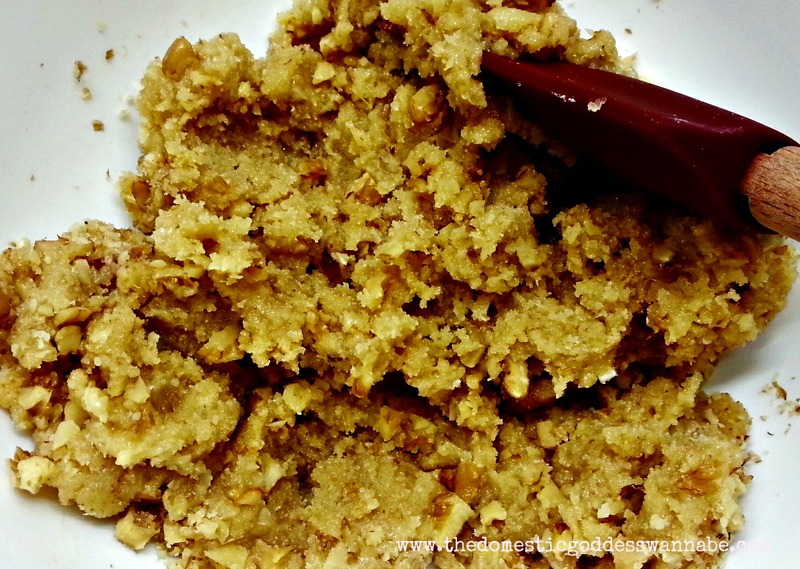 The walnuts were added to the crumb mixture, and mixed together with a spatula. A piece of cling wrap was placed on the mixture, and it was kept in the fridge. 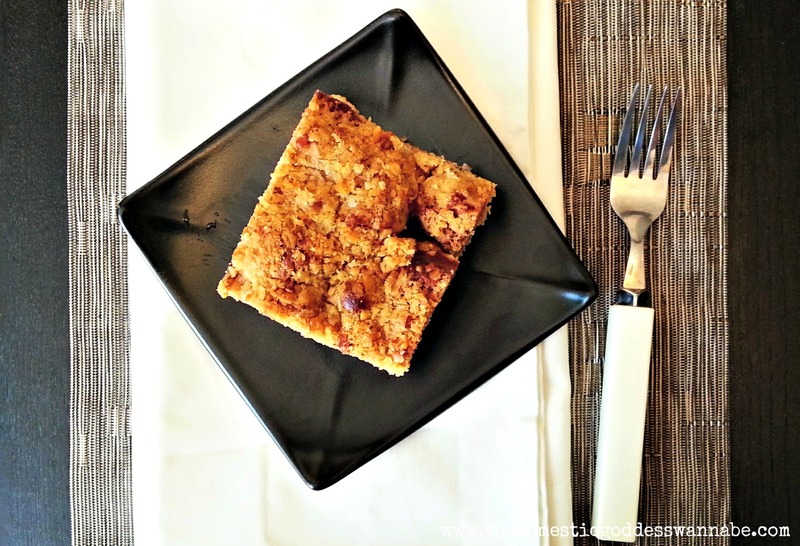 This would allow the butter to harden again and make a crunchy crumb topping. It is important to start with this step – do not be tempted to make the cake before the crumb mixture! 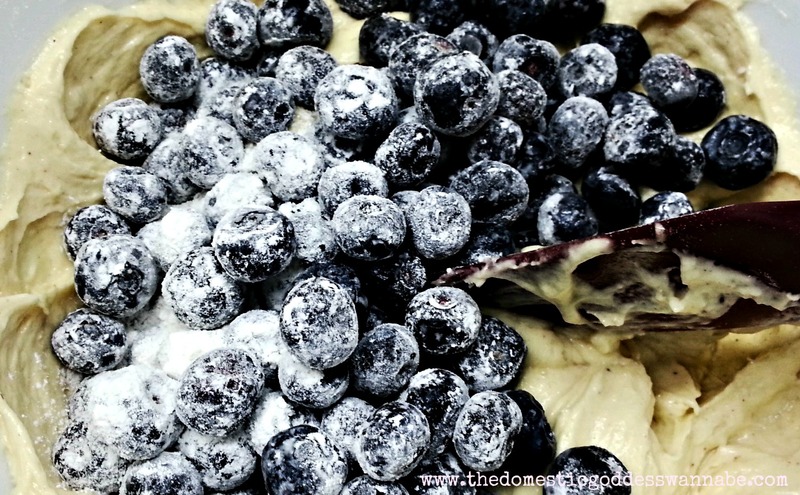 To get started on the cake, the frozen blueberries were placed in a bowl and 2 teaspoons of flour was sifted directly onto the blueberries. 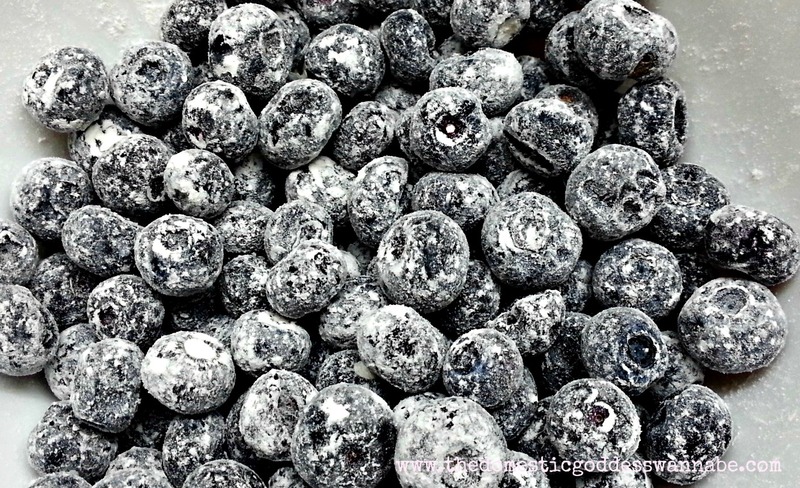 Using my finger tips, I tossed the blueberries to coat them. This prevents the fruit from sinking to the bottom of the cake when baking. I sifted the dry ingredients and whisked to mix them. The dry ingredients were then set aside. 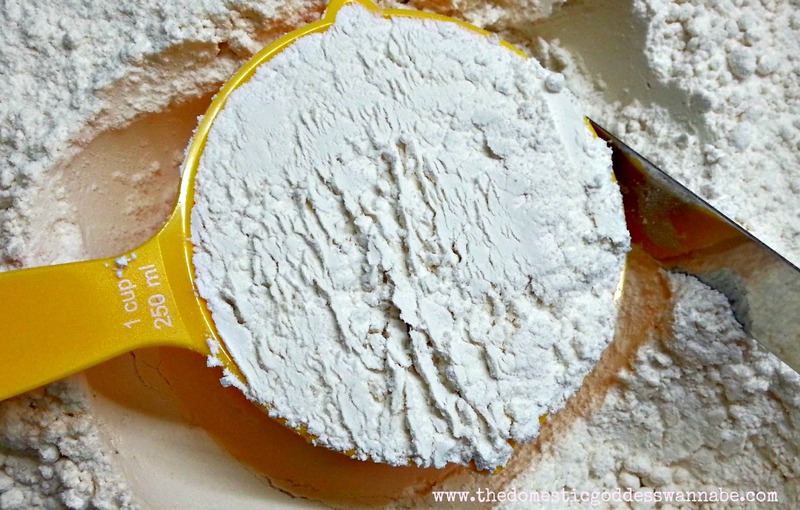 When measuring flour, always use a spatula or the back of a knife to level the flour. 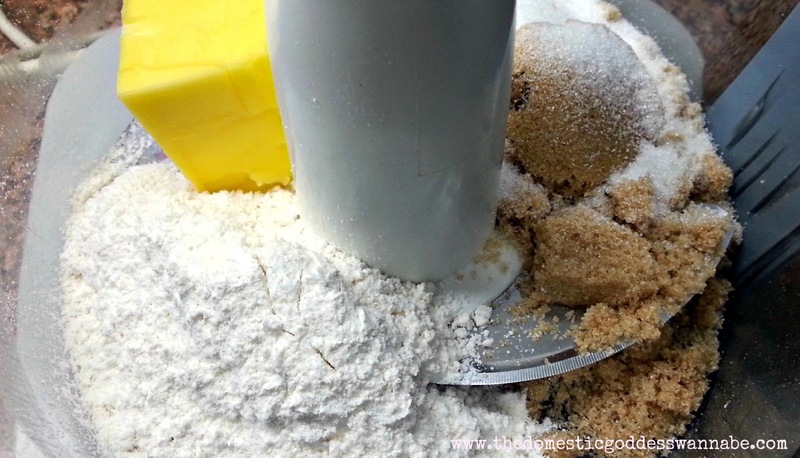 You do not want a heaped cup of flour unless the recipe calls for it. Getting your measurements right is crucial in baking!! I grated the zest of an orange (I ran out of lemons) directly into my mixing bowl. Using my fingertips, I rubbed the sugar and orange zest together. This produced a sugar mixture that was moist and smelled heavenly! 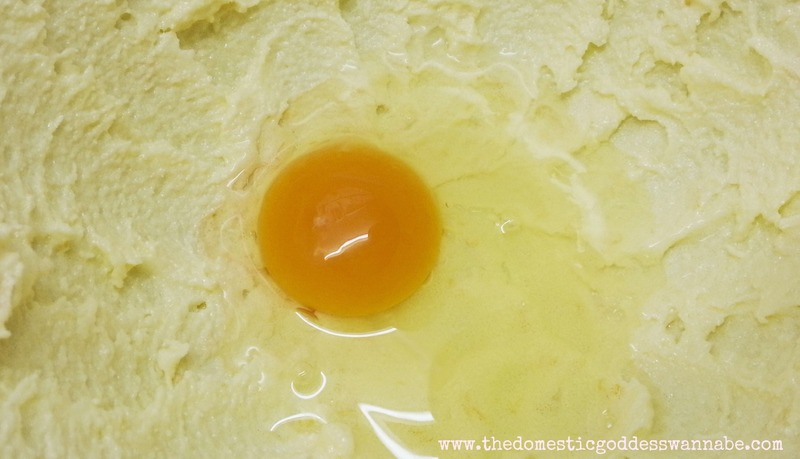 The butter was added, and beaten at medium speed until the mixture became light. This took about 3 minutes. An egg was added and beaten for another minute. Then I repeated the process with the second egg, and lastly, the vanilla extract. At this stage, the mixture looked like it had curdled. But it will smooth out, so there is no need to worry. 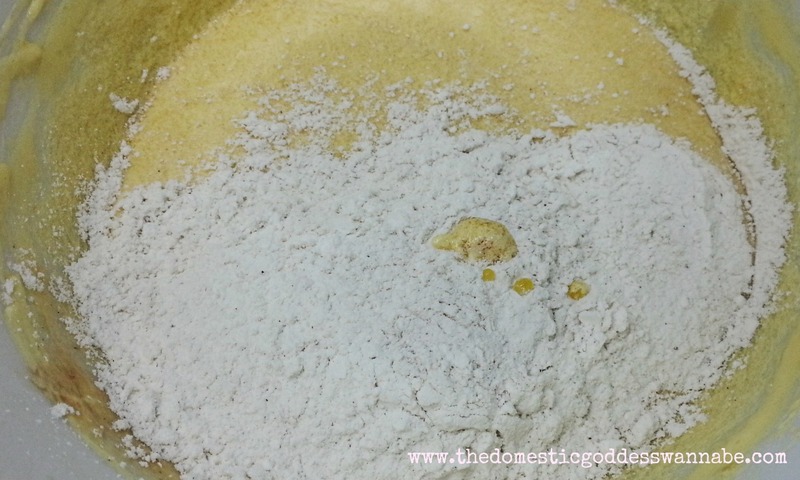 The flour was added in 3 parts, along with the buttermilk in 2 parts (flour-buttermilk-flour-buttermilk-flour) and a thick, creamy batter was formed at the end. The berries were folded into this mixture. Be gentle. 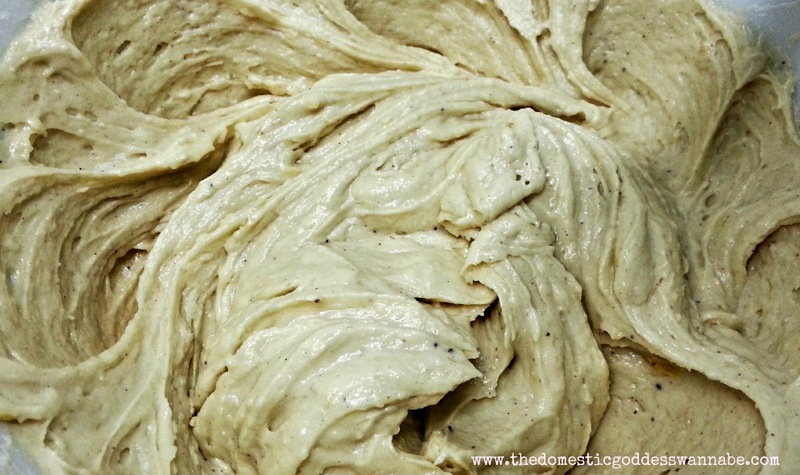 The batter was transferred to a lined and greased baking pan and the top was smoothed gently with a spatula. The crumb mixture was broken up and placed on top of the cake. I pressed the crumbs down very gently to get an even layer. My cake was baked in 50 minutes – you need to understand your oven so you can adjust the baking time. The cake is done when a skewer emerges cleanly after being inserted into the thickest part of the cake. It was allowed to cool in the pan for 30 minutes before I transferred it onto a cooling rack. I cut the cake. My helper and I each took a bite at the same time, and we both went HMMMMMM! 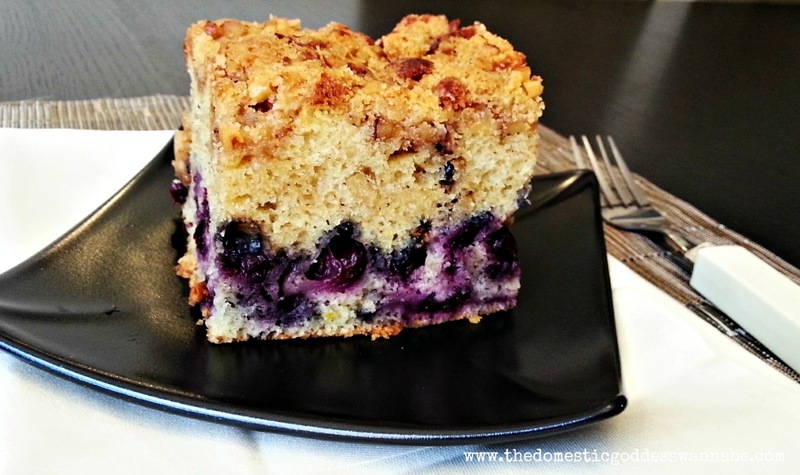 The base of the cake was tender and a little sour from the blueberries but this was balanced by the top of the cake which was crunchy and not overly sweet. *The cake is best serve on the day it is made but it can be wrapped well and kept overnight at room temperate. You can use all berries, except strawberries (as they are too wet) as well as with slices or cubes of soft fruits like peaches, nectarines, apricots or plums. Getting ready: Center a rack in the oven and preheat the oven to 175C. Butter an 8×8-inch pan (Pyrex is great for this) and put it on a lined baking sheet. 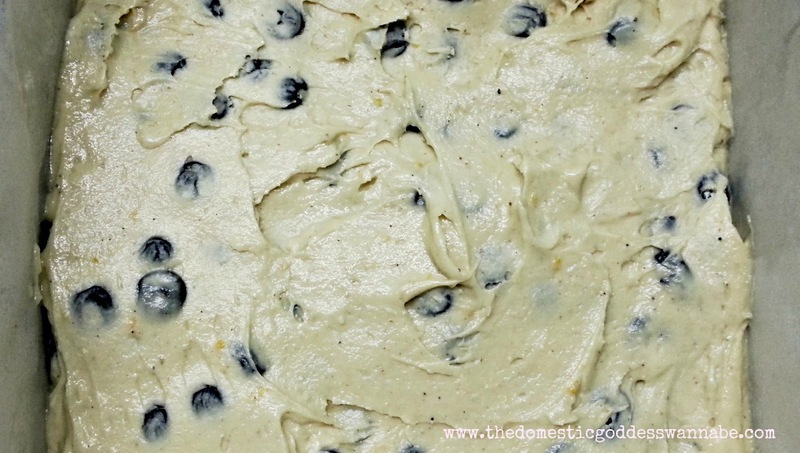 To make the cake batter: Using your fingertips, toss the blueberries and 2 teaspoons of the flour together just to coat the berries; set aside. Whisk together the remaining 2 cups flour, the baking powder, soda, salt, cinnamon and nutmeg. Working in the bowl of a stand mixer or in another large bowl, rub the sugar and zest together with your fingertips until the sugar is moist and aromatic. Add the butter and, with the paddle or whisk attachment, or with a hand mixer, beat the sugar with the butter at medium speed until light, about 3 minutes. Add the eggs one by one, beating for about 1 minute after each addition, then beat in the vanilla extract. 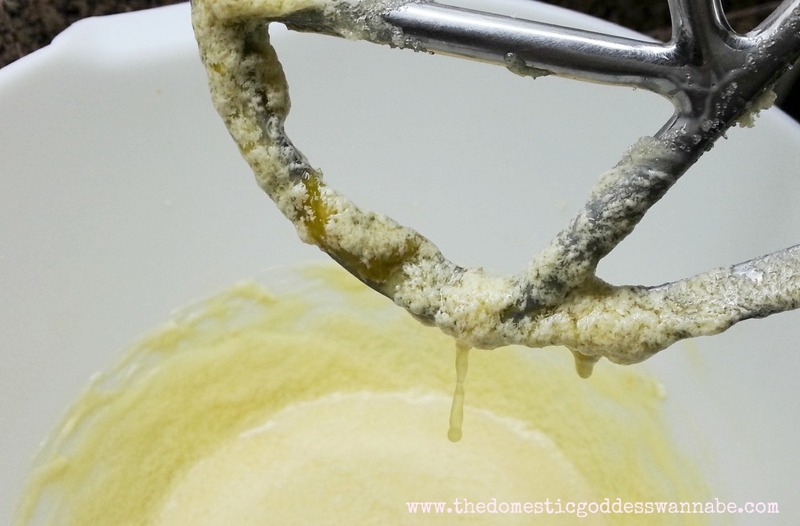 Don’t be concerned if the batter looks curdled — it will soon smooth out. Reduce the mixer speed to low and add the flour mixture and the buttermilk alternately, the flour in 3 parts, the buttermilk in 2 (begin and end with the dry ingredients). 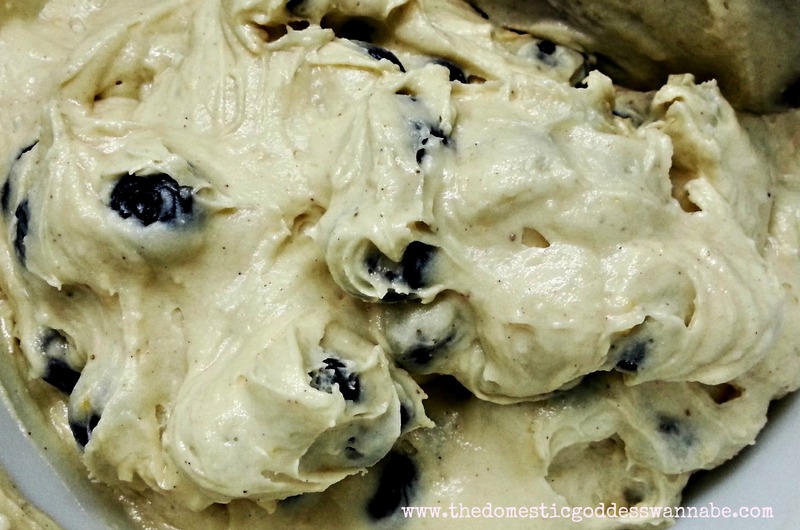 You will have a thick, creamy batter. With a rubber spatula, gently stir in the berries. Scrape the batter into the buttered pan and smooth the top gently with the spatula. Pull the crumb mix from the refrigerator and, working with your fingertips, break it into pieces. There’s no need to try to get even pieces — these are crumbs and they’re supposed to be lumpy and bumpy and every shape and size. Scatter the crumbs over the batter, pressing them down ever so slightly. 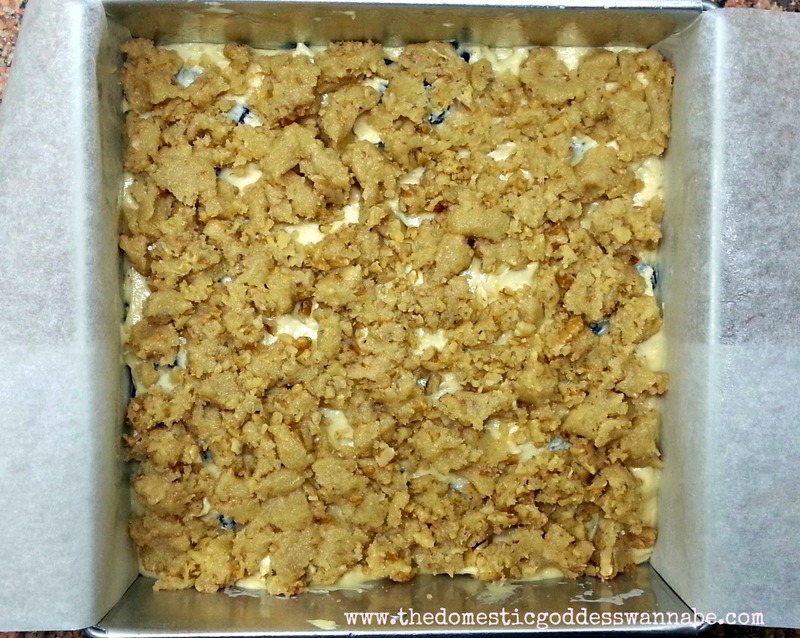 Slide the sheet into the oven and bake 55 to 65 minutes, or until the crumbs are golden and a knife inserted into the center of the cake comes out clean. Transfer the cake to a rack and cool just until it is warm or until it reaches room temperature. Serving: Like all good coffee cakes, this needs nothing but coffee — or tea. Storing: Best served the day it is made, the cake can be wrapped well and kept overnight at room temperature.